Pakistan’s first woman architect and designer of disaster relief shelters, Yasmeen Lari, will be a key presenter at a free public lecture The Architecture of Humanity at RMIT on 8 August. Part of RMIT’s Humanitarian Architecture Week Public Program from 8–9 August, ‘The Architecture of Humanity’ will feature Yasmeen Lari and US architect, writer and disaster relief expert Eric J. Cesal, who will share their stories of architects transforming lives through design. Yasmeen Lari is Pakistan’s first woman architect and one of the most successful providers of disaster relief shelters in the world. With multiple major natural disasters in Pakistan in recent times – such as the 2005 earthquake, the floods of 2010, and the Sindh Floods of 2011 – natural disasters have provided the backdrop to much of her later work. After Pakistan’s 2005 earthquake, she devised various programs based on women-centred zero carbon footprint structures and sustainable building techniques, resulting in 40,000 green shelters (using bamboo, lime and mud). Among the best known architects in Pakistan, Lari has also built several landmark buildings, such as the FTC, PSO House and ABN Amro Bank, Karachi. 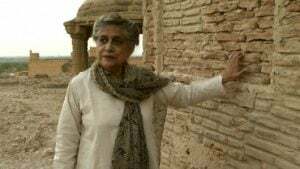 In 1980, Lari co-founded Heritage Foundation of Pakistan with her husband, historian Suhail Zaheer Lari, for undertaking research and safeguarding Pakistan’s cultural heritage. As UNESCO’s National Advisor (2003–2005) she led the team that saved the endangered Shish Mahal ceiling in the Shah Burj (the Royal Tower) of the Lahore Fort World Heritage site. She has also conserved several other historic monuments in the World Heritage Sites of Makli and Lahore Fort as well as important heritage sites in other parts of Pakistan. She is a member of Punjab Government Steering Committee for Lahore Fort and Shalamar Gardens, member of UNESCO Consultative Committee for Moenjodaro, Board Member of Earthquake Reconstruction and Rehabilitation Authority (ERRA) and Trustee of Transparency International Pakistan. Eric J. Cesal is a designer, writer and noted post-disaster expert, having led on-the-ground reconstruction programs after the Haiti earthquake, the Great East Japan Tsunami, and Superstorm Sandy. Cesal’s formal training is as an architect, with international development, economics and foreign policy among his areas of expertise. Cesal has been called “Architecture’s First Responder” by the Daily Beast for his work leading Architecture for Humanity’s post-disaster programs from 2010 to 2014. Cesal is also widely known for his book, Down Detour Road, An Architect in Search of Practice (MIT Press, 2010), which sought to connect architecture’s chronic economic misfortunes with its failure to prioritise urgent social issues.